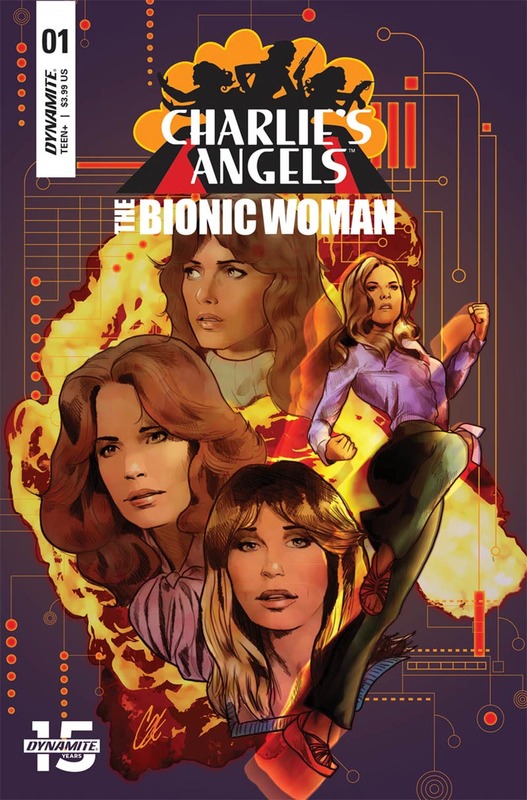 Dynamite is firing up their new line of alternate reality series called Altered States and they are kicking things off with Vampirella, The Shadow, Doc Savage and Red Sonja. Writer of the on-going Vampirella series Nancy A Collins is taking on the variant tale of the iconic female vampire and Byron Brewer talked to her about it. BYRON BREWER: So, Nancy, Dynamite is establishing Altered States as a vehicle likeWhat If? and Elseworlds. What kinds of freedoms does this give writers not usually found when handling a work for hire property such as Vampirella? NANCY A. COLLINS: Well, you can completely re-work the concept of the character without worrying about its effect on the series’ continuity. It’s more like a ‘dream’ than reality—whatever might happen, or how crazy you get, you know you don’t have to worry about the clean-up on Aisle 5 once it’s over. BB: No one knows Vampirella like you these days. How does your AS version differ from the real deal, and what is similar? NAC: I took the original idea for the character—vampire from outer space—and completely flipped it around. Instead of being Vampirella from Drakulon, she is Lt. Ella Normandy, sole survivor of an Earth space ship that crash lands on Drakulon. I also have her meeting Drakulonian versions of Adam Van Helsing and his father. BB: Instead of horror, your usual genre, you get to do Vampi as science fiction. How did you cope with that? NAC: To be fair, I’m doing Vampi as ‘science fiction’ of the same quality as her original appearance, which means it’s more planetary romances ala Edgar Rice Burroughs and Otis Adelbert Kline. I just flipped things around, so that she is a stranded spacewoman on a planet of vampires, while keeping some elements the same—such as the fact she’s physically stronger, has the power of flight, and, by Drakulon’s definition, is considered a monstrous outsider even though she is possibly their greatest defender. This story is for all the fans who have told me ‘I miss her being from outer space’. Well, here you go. BB: Tell us about Planet Drakulon. NAC: I had to make a lot of it up from whole cloth, as there’s not that much about Drakulon as a planet or society. It’s depicted as being a desert planet ala Barsoom or Arrakis from Dune, where not only does it rain blood, but the rivers and oceans are composed of it as well. The Drakulonians used to be far more technologically advanced than Earth, and are recovering from a great war that not only wiped out a lot of their tech—especially their weaponry— but their population as well. The Drakulonians are in constant battle with a mutant race called the Drakkar for control of “The River of Life”, which feeds their largest city. Ella Normandy promptly walks right into that war—armed with technology and weapons far more advanced than the Drakulonians now have (Ella comes from the year 2069, by the way)— and has to decide whether to pick a side or let them kill each other. BB: Was it fun doing this with artist Francesco Manna? NAC: Yes. He did a great job. I sent him quite a bit of reference material, such as old pulp magazine covers for Captain Future and stuff involving Adam Strange from DC’s oldMystery in Space series. New York Times #1 Bestselling author Brandon Sanderson (Mistborn, The Stormlight Archive), writer Rik Hoskin (Red Rising, Mercy Thompson) and artist Fritz Casas (Red Sonja, Miss Fury) close out this arc of the Cosmere tapestry with a bang. 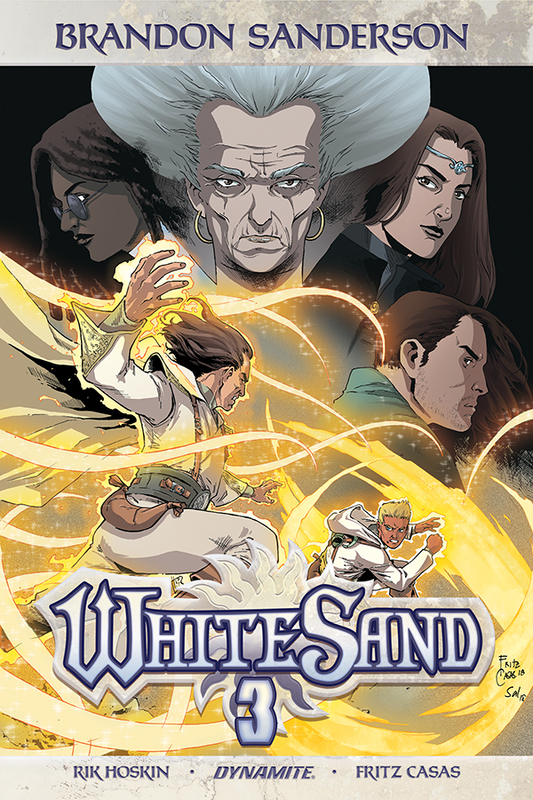 On the planet of Taldain, legendary Sand Masters harness magic-like abilities to manipulate sand in wondrous ways. Following hushed conspiracy and slaughter, one still stands - the hero Kenton! Through previous volumes Kenton has come across allies and foes, honed his abilities and unearthed hidden secrets among the action and political intrigue. In this climactic chapter, Kenton must mine his willpower and abilities to survive and finally discover the truth. "It has been a pleasure working with Dynamite and a highlight of my career to see one of my stories told so well in this medium," said writer and creator Brandon Sanderson. "Rik’s great adaptation blended with Fritz’s artistic vision bring the White Sandtrilogy to an epic conclusion." COSPLAY WOMEN OF DYNAMITE TRADING CARDS FOR MAY! Cosplay is one of the oldest and beloved core parts of comic book fandom. Long before the Internet and social media, super fans were toiling on costumes to wear to the earliest conventions. Two of the most popular cosplay inspirations in the 1970s and 80s were Dynamite's flagship characters Red Sonja and Vampirella. Their iconic and tantalizing looks were perfect for this emerging form of artistic expression. Some of these models even graced the covers of their favorite heroines' titles professionally, such as Barbara Leigh, Julie Strain, Maria di Angelis and others as Vampirella. Writer/artist Wendy Pini (Elquest) and others were known for their Red Sonja cosplay. 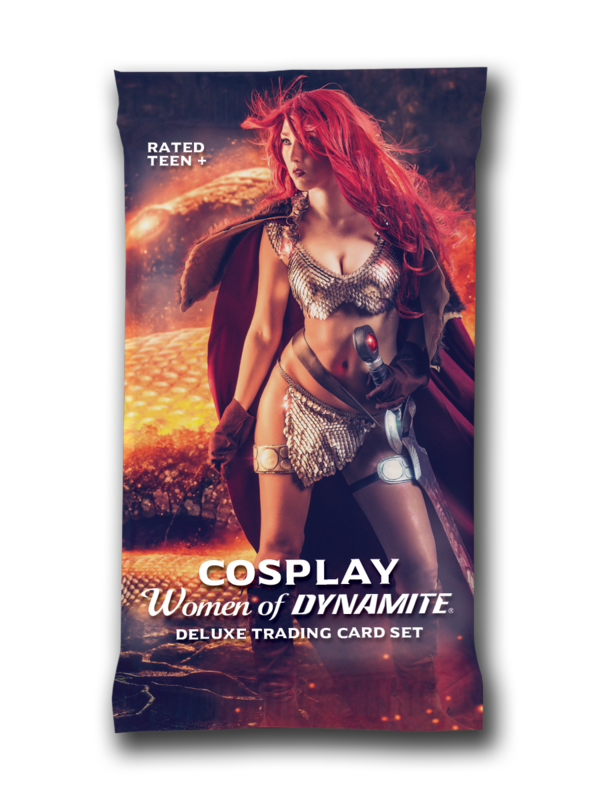 Today Dynamite is the leading publisher of cosplay comic book covers and is proud to work with so many talented costume artists, models and photographers. Fans can find characters including Red Sonja, Vampirella, Dejah Thoris, Sheena and more portrayed by the most popular and talented cosplayers today. Jenifer Ann, Ani-Mia, Karrigan Taylor, Jacqueline Goehner, Jessica Felice, Shannon Kingston, Valerie Perez, Samantha Estrada and so many more have graced the covers of Dynamite comics. On the sketch card front, Dynamite works with the greats in this medium as well. Artists in this set include Axe, Ken Haeser, Kevin Graham, Mike Lilly, Mitch Ballard, Rich Molinelli, Sanna U, Tim Shay and tons more talented artists! Every individual foil pack includes 2 Base Cards, 2 Sketch Cards, 1 black and white art card, 1 puzzle card, and 1 autographed card. Retailers and fans can order the cards by individual foil packs or by boxes.